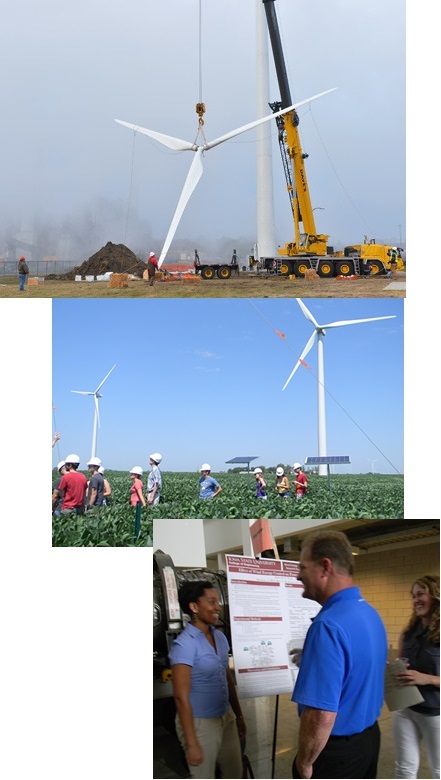 Iowa State University offered an exciting 10-week on-campus research program in Wind Energy Science, Engineering, and Policy (WESEP) for undergraduate students. Ten fellowships were sponsored each year by the National Science Foundation’s (NSF) Research Experiences for Undergraduates (REU) program. Students worked in research teams with faculty and graduate students to receive training and get hands-on research experience in areas that address critical, long-term national needs in wind energy-related areas. The program covered on-campus housing and a meal plan for all participants. Students received up to $650 of travel expenses to and from Ames and a $5,000 stipend. Outside of the research experience, social events with other REU students at Iowa State were also available. One-on-one mentoring: Each student was assigned a faculty mentor for weekly meetings and a member of the research team who served as a daily contact person. Opportunity to make a research contribution: Each student participated in an individual research project within the faculty-led team. Research projects focused on one of four areas: wind energy resource characterization and aerodynamic loads; wind energy conversion systems and grid operations; manufacturing, construction, and supply chain; or reliability and turbine health monitoring. Core training: Students attended short-courses on wind energy science, engineering, and policy topics led by faculty and senior researchers, as well as participated in workshops with faculty, to provide a broad knowledge base in wind energy science, engineering, and policy. Field trips: Students visited operating wind farms, turbine and blade manufacturing, and other wind energy-related companies in Iowa. Industry networking: Each week students participated in “Brown Bag Lunch and Learn” sessions where industry experts from national laboratories, wind turbine manufacturers, wind farm developers and operators, wind turbine construction companies, maintenance providers, weather prediction consultants, electric utilities, independent service operators, and advocacy organizations made presentations and engaged in discussions about wind energy topics with students. Research products: Each participant produced three high-quality resume items: a research poster, a publish-quality research paper, and a presentation at the REU Symposium (http://www.meteor.iastate.edu/windresearch/resources/Binder1.pdf) as products of this experience. Letters of recommendation can be sent to: jkj@iastate.edu. This Research Experience for Undergraduates was sponsored by the National Science Foundation.